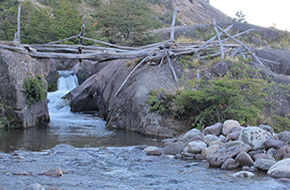 All tourist activities leave from the Río Cóndor sector, where the accommodation facilities are based. They then lead to the Río Cóndor, Río Grande, Mackenna and Martínez de Rozas sectors, all part of Estancia El Cóndor. You cross the Rivers Cóndor and Condell, passing by the “Cartel de Bautismo”, which recreates the phrase used by Francisco P. Moreno when he named the lake he had discovered. After climbing through a mature lenga beech forest you come to a cliff which is 630 m high. 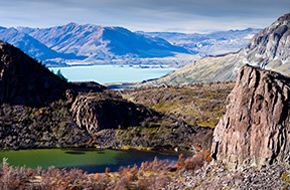 Impressive vistas of Lake San Martín, its peninsulas and the Andes mountains can be fully appreciated from here. The trek lasts 4 to 6 hours. 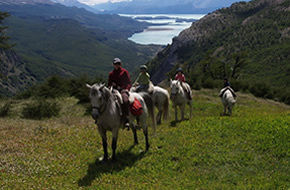 This walk skirts the slopes of Mounts Radboone and Fernández, following the Rio Cóndor valley. 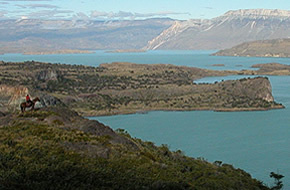 You go through high deciduous and Antarctic southern beech forests and cross the rio Cóndor, before reaching the lake. Depending on the weather, you can return by the Andean meadow at an altitude of 1000 m. This trek takes between 6 and 8 hours. The path climbs until you get a panoramic view of the Estancia’s main buildings and the Maipú Inlet. Then you go over the bridge across the River Cóndor and its gorge. The walk continues along a woodcutters’ path through a mature high deciduous southern beech forest with old logging paths and tree stumps. Patches of saplings testify to forest renewal. We can contemplate trees that are centuries old, and vistas of River Condell and Lake San Martín. This walk takes between 4 to 6 hours. The first part coincides with the Bosque Leñero Track. Afterwards, there are two options which go in the direction of the lake. Both border the edges of a moraine on the right of the path. The first departs from the Rio Cóndor bridge and the other goes by way of the River Condell ford. Both arrive at the River Condell gorge and its old bridge. 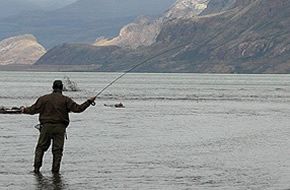 Torrent ducks have been recorded here, and there are pools for catch and release fishing. This trek takes between 3 and 5 hours. The first part coincides with the track to the Condorera, but before reaching it there is a detour that heads westwards. You come to a burnt area, with signs of degradation caused by fire and overgrazing, and you pass several lakes with aquatic bird life. 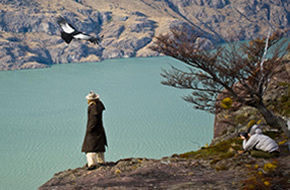 You can then descend by the second Andean condor roosting spot in the direction of rio Grande, walking below the cliffs or along the road. It takes between 6 and 8 hours. 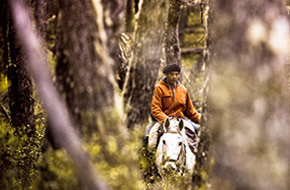 You reach the River Grande by means of paths or by road. Before reaching the river you’ll see evidence of a volcanic eruption, and three southern beech tree species. The River Grande has a wide gorge with paths going down to its source or mouth. In the pool downriver you can do catch and release fishing. Finally, a visit to the southernmost conifers in the world. It takes between 6 and 8 hours. Departing from the Rio Grande you have are two different altitude options. The lower one fords the River Gallo up to the T Peninsula, and then climbs along the Zig-Zag Path. 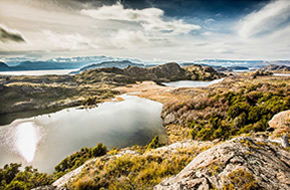 On the upper route you can appreciate panoramic views of Lake San Martín. Both options come together on the La Nana Path. The last part crosses a meadow and takes you to La Nana and Jimmy Radboone’s old estancia buildings. You will spend 6 to 8 hours on this walk. The La Nana outpost is used as a base. We go in a northwestern direction bordering“Morro de Las Banderas” (Las Banderas Hill). 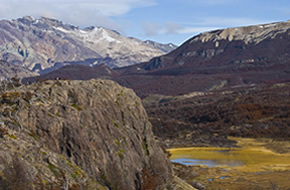 In the Mackenna, grasslands and shrubs are prevalent, with scattered evergreen and high deciduous southern beech trees and Guanaco Bushes (Anarthrophyllum desideratum). The area is dotted with lagoons about, with rich aquatic birdlife. On the southern tip there is a large inlet which is ideal for sport fishing. From La Nana it takes between 5 and 7 hours. From La Nana you take the path to Mackenna Peninsula, passing by two great lagoons frequented by ducks, grebes and coots. Ford the River Mackenna and the path then leads you between small lakes surrounded by evergreen southern beech trees. You will arrive at the 62 trig point on the border with Chile. In the distance you can see the Candelario Mansilla border post. The walk takes 6 to 9 hours.